Although described as a publication of general interest How to Understand Your Gender is primarily directed to people pondering their own trangender/non-binary/gender diverse identity. While some effort is made to include examples illustrating the cisgender point of view, the general reader would typically need more theoretical and political context than is presented here. Its format of exercises and pauses for breathing and reflection make it ideal for use in a small workshop context or for individual study. The authors are Alex Iantaffi (“a transmasculine person in my mid forties . . . a girl when I was born I identify as being somewhere in the masculine territory of gender”); and Meg-John Barker (“Genderwise I’m a non-binary—or genderqueer—person in my early forties . . . somewhere in the middle of the spectrum between masculine and feminine”). How to Understand Your Gender is presented in five sections guiding the reader to an understanding of gender as the wider world sees it, in institutions and communities, and in intimate relations. Sections are devoted to alternative gender neutral pronouns (e.g. ze, per, hir) and descriptors. A number of role models are proposed in the chapter Gender Pioneers and Gender Warriors. These pioneers include some familiar public figures—Prince, Laverne Cox and Kate Bornstein—as well as the probably less well known S. Bear Bergman and Pema Chodron. 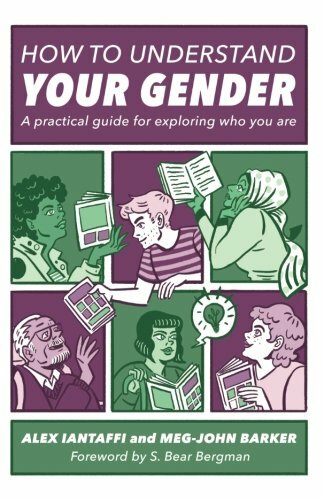 How to Understand Your Gender is a practical entry level guidebook for people who wish to challenge gender binarism, and should contribute to binarism’s ongoing evolution.